It’s Christmas morning in Dreadful Deirdre’s household and once again she hasn’t received a present from Father Christmas. Incensed and angry, she orders her minions, Snatchitt and Snaffle, to go to the North Pole to bring back Santa’s head on a plate. By the time they arrive the Elves, under the management of Reindeer Ruby and her son Ronnie, are packing everything away and putting the reindeer, including Rudolf, to bed for their summer hibernation. Meanwhile the Professor and his assistant Smithers are putting the finishing touches to their latest inventions. 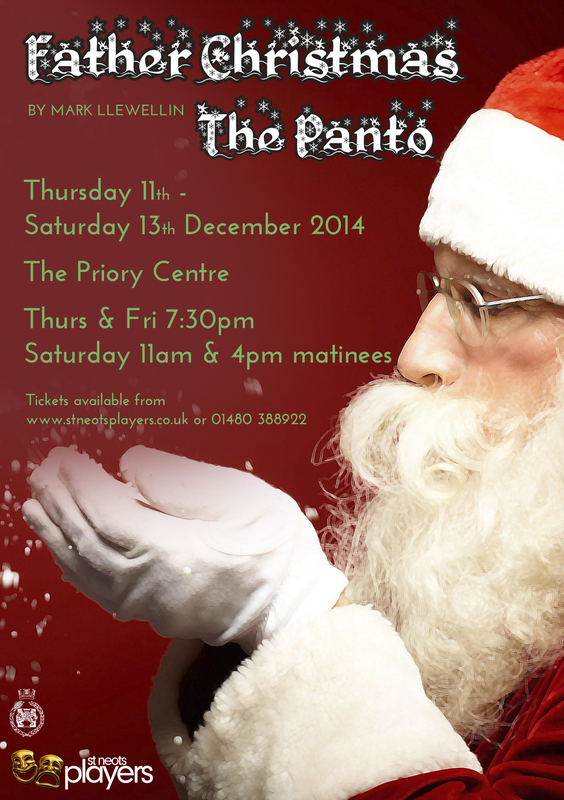 Father Christmas the pantomime will definitely get you in the mood for Christmas, with some familiar and some not so familiar songs, hilarious antics, amazing dance routines and all of the Panto elements you would expect to entertain young and old alike. There may even be snow! Whoever claimed that pantomime is easy has ,very clearly, never tried to present a sparkling example of the genre at 11 o’clock in the morning on a busy shopping day in mid December with an audience ranging in age from ‘one to ninety two’ … as the lyrics of one well known Christmas song tell us. St. Neots Players not only gave us a sparkler, they gave us a shining, starry, top-of-the-tree exemplar of what this art form is all about: magnificent not maleficent! My first visit to the Priory Centre and to the work of the long established and much acclaimed St Neots Players was a morning to remember with its fantastical and potent mix of the traditional and the innovative, the standard and the spectacular. Despite not being one of the ‘big six’ of pantos, this new version of a Santa and the elves tale by Mark Llewellin provided everything any three year old or sixty year old child could desire :from colourful costumes to cross-dressing dame and principal boy, from creaky but beautifully delivered jokes to pathos and pizzazz, from competitive sing-along to classy choreography, from patter songs to melodic ballads, from ‘Look behind yous’ to ‘Watch out for the snowballs!’ Yes, there was a terrific, pre-finale snowball fight enjoyed by us all without ‘elf and safety’ being compromised or ‘the national elf service’ being called in to assist. From the slightly low key opening, the piece was masterfully directed by Maxine McKay to produce optimum ‘Oohs’ and laughs from an increasingly captivated audience. I loved the sets, believing that you can’t beat a few beautifully painted backcloths and a truly wonderful Santa’s toyshop scene in a masterpiece of technical wizardry. Red and green hats off to production manager Maxine McKay, Dan Cooper and his stage management team, Scott Andrews on sound and Martin Inward on lights as well as the rest of the formidable crew on costumes, props and other backstage elements which did so much to enhance a superb piece of theatre. Sometimes the title ‘Creative Team’ doesn’t really provide an accurate description but in this case, the sets, snow effects, slickness of scene change and all other aspects of the production were truly inspired. In front of the atmospheric cloths and in a well dressed toyshop, was played a master class in the art of panto. The whole cast including all the elves and the LDA dancers as toys and reindeer worked as an energetic and unflagging team maintaining pace and performance at a cracking rate. Tony Knox was very fine indeed as Reindeer Ruby a dame with heart and a terrific singing voice. All the excess in costume and wild asides was there but it was underpinned by truthfulness and warmth that made him a delight to watch and a strong presence to hold the show together. Similarly, Snaffle and Snatchitt, classic broker’s men roles in the Little and Large or Chuckle Brothers’ mould, brought us definitive portrayals by Lol Smith and Don McKay. Charismatic personalities and perfect comic timing emanating from extensive stage experience always helps, but this double act brought a smile to our faces with both the terrible scripted jokes and the well turned ad-libs. I looked forward to every entrance and stereo punch line and was particularly taken with a well sung and ultra comical rendition of Terry Scott’s classic ‘My Bruvver.’ Simple transformations such as the one to Hermione and Dandelion ,with the addition of plaits from the elf hats, lipstick and a skip in their step, proved that you do not have to be coarse or ‘OTT’ to win over an audience. Other good performances came to us via Kate Nizzer as a strong and believable principal boy Ronnie, an attractive foil for the comic leads, a marvellously monstrous villainess ( ‘Reindeer roasting on an open fire…’) in the shape of Helen Price as Deirdre both of whom received sterling support from Chris Baker as a genial Father Christmas, Eddie Knight as an eccentric Toy Professor and Paul Hutchinson as an unsmilingly effective Smithers. Not everyone is given the best laugh lines in panto and the only obvious note I would give is that seemingly throwaway lines or continuity speeches have to be delivered strongly and with real drive to keep the performance energy high and a mixed age audience engaged throughout. A split second pause in panto can seem positively Pinteresque! That being said ,there were so many wonderful things to enjoy, the choreography being a highpoint for me. Raffan Rivers as Rudolf is a star in waiting and I loved both the Nutcracker style ballet performed to Mike Oldfield with its brilliant lift at the close as well as the funkier routines with their mix of very small, young dancers and older dancers of note in well synchronised crowd pleasers. Much praise to the choreographers: Tom Langdale, Amy Jo Liddle and Kate Nizzer. The Dame’s patter with the selfies, neatly timed Harry Potter jokes, the old magic hat routine, the jokes (‘my husband went out for a tin of peas and never came back, what did you do, opened a bag of carrots’ style) delivered to produce a groan from the old and a laugh from the young, soft shoe shuffles and community singing: all were much appreciated by me and the young people around me. I am going to have to ‘nit pick’ to find any fault, but I did think that some recorded backing tracks worked better than others, some slowing down the action or not allowing for the mellifluous voices possessed by many of the cast to lift us. I much prefer a live musician or two. I also thought that a few of the less experienced actors did that ‘short pace walk’ up and down that amateur actors sometimes do instead of using the whole stage or engaging the audience more broadly. That being said, two of the best moments for me were contained in the songs ‘Somewhere’, rendered very touchingly by Tony Knox’ marvellous voice, and Tony and Don McKay’s duet of ‘Baby It’s Cold Outside’ from which recent star performers of the song such as Michael Buble and Idina Menzel would have learned much about the art of staying true to an original whilst creating a poignant and innocent chemistry. So thanks galore go a warm and welcoming front of house team, the director, choreographers, cast and crew for a most entertaining pantomime that enchanted and enthralled a largely young audience, but what will stay with me is the truthfulness of character and acting worthy of a deeper and more serious art form from Don McKay and Tony Knox. Absolutely stunning performances: the best I have seen in amateur theatre this year.